R/. "Their message goes out through all the earth." 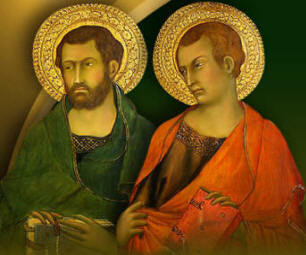 St. Simon the Apostle is often named St. Simon the Zealot, to distinguish him from St. Peter and St. Simeon. St. Simon was a Galilean, born at Cana in Galilee. He was called Simon the Zealot because of his great zeal to honor God and for purity of religion. The Zealots during this time were known for assassinating the noble and filling the temple with bloodshed and profanities. After his conversion and his call, there is no further mention of him in the Gospels. He became zealous for Christ and for the duties of Christianity. After receiving the gifts of the Holy Spirit, he went out to evangelize with great zeal and fidelity. He was martyred by the idolatrous priests and many say that he was crucified. His relics are with St. Jude’s in St. Peter’s basilica and the Cathedral of Toulouse. St. Jude (Thaddeus) appears last in the list of the twelve Apostles of Jesus Christ (Matthew 10:3; Mark 3:18). We do not even know how he was chosen to be one of his disciples. Luke calls him “Judas son of James” (Acts 1:13). John calls him, “Judas, not the Iscariot” (John 14:22). This distinction is necessary given that Judas Iscariot betrayed Jesus. “Judas” is a Hebrew word that means: “praise be given to God.” Thaddeus means: “courageous to proclaim his faith”. After the Last Supper, when Christ promised that he would manifest himself to those who listened to him, Judas asked him why he wouldn’t manifest himself to everyone. Christ answered that He and His Father would visit those who love Him: “we will come to him and make our dwelling with him.” (John 13:22-23). We know nothing else of the life of St. Jude (Thaddeus) after the Ascension of the Lord and the coming of the Holy Spirit. St. Jude (Thaddeus) is one of the most popular saints because of the numerous heavenly favors that he grants to his devotees who pray to him with faith, especially when seeking a job or a house. St. Bridget relates in her Revelations that Our Lord recommended to her that when she wanted to attain certain favors, to ask for them through the intercession of St. Jude Thaddeus. He is often confused with St. Thaddeus of the legend of Abgar and has been said to have died peacefully in Beirut of Edessa. According to the western tradition, as it appears in the Roman liturgy, he met with St. Simon in Mesopotamia and both preached for several years in Persia where they were martyred. A presumed account of the martyrdom of the Apostles exists, but the Latin text is not dated until the second half of the 6th century. The document has been attributed to Abdias, who is said to be a disciple of Simon and Jude and was consecrated by them as the first bishop of Babylon. According to ancient tradition, St. Simon was martyred by being sawed in half and St. Jude was beheaded with an axe. For this reason he is often portrayed with an axe in his hand. As such, the Western Church celebrates them together, while the Eastern Church separates their respective feasts. There are different legends about St. Jude by Eusebius, but they have little foundation. Those who are devoted to him should be careful not to fall into certain abuses, like the “miraculous novena” to St. Jude Thaddeus which offers the devotee great economic rewards on the condition that they make copies of it and send them to many people. This novena falls under superstition and is centered more on economic interest than in striving for holiness. - Sálesman, P. Eliécer, Vidas de Santos # 4. Return to Main Page of the Saints..